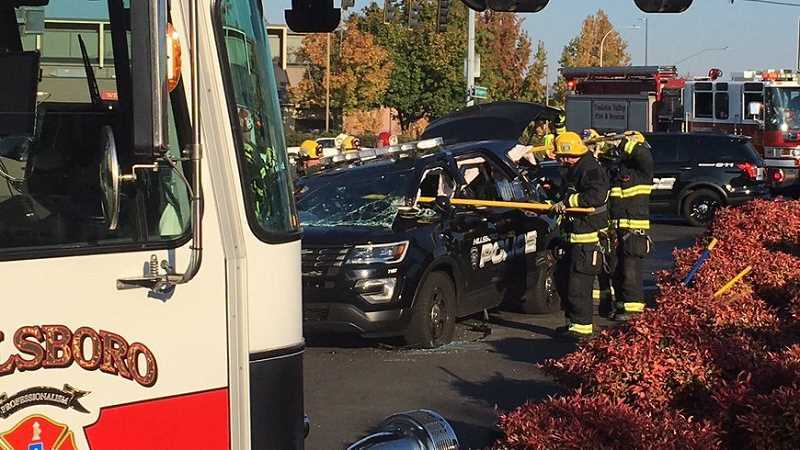 A Hillsboro police car carrying an officer and cadet was struck by a pickup truck Sunday afternoon. Three people, including a Hillsboro police officer and a young cadet, were injured in a two-car crash in Tanasbourne on Sunday afternoon, according to the Hillsboro Police Department. 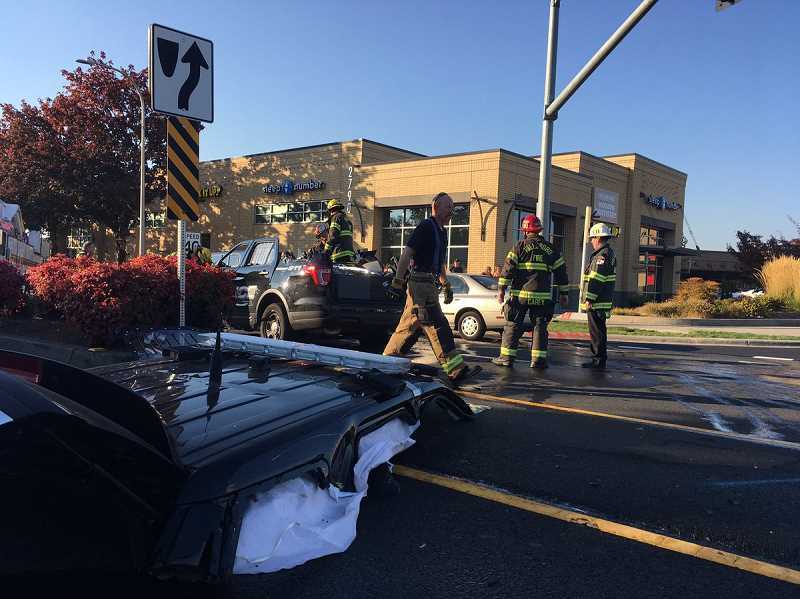 On Sunday, Oct. 21, a Hillsboro patrol car was on its way to a call for service when it was struck by another vehicle at 185th Avenue and Evergreen Road in Tanasbourne, the department said on Sunday. According to Sgt. Eric Bunday, a spokesman with Hillsboro Police, the police patrol car had its lights and siren on as its drove through the intersection at about 3:19 p.m. As the vehicle crossed through the intersection headed westbound, a green Dodge Ram pickup truck heading south on 185th Avene crashed into the passenger-side of the squad car. The crash sent both vehicles reeling. Both came to a stop on Evergreen Road, Bunday said. The driver of the pickup truck, whose name was not released, was injured in the crash. He was taken to a hospital with non-life threatening injuries. The patrol car was driven by a Hillsboro police officer. A police cadet was in the front passenger seat and needed to be extricated by firefighters. Cadets — young men and women between the ages of 15 and 20 — wear police uniforms and sit in on ride-alongs with officers to learn about careers in law enforcement. Neither the officer nor the cadet's name have been released. Both men suffered non-life threatening injuries and were taken to a local hospital by ambulance. Firefighters from the Hillsboro Fire Department and Tualatin Valley Fire & Rescue had to cut the roof of the patrol car off in order to remove the cadet, Bunday said. Freeing the cadet took about a half hour. "We're hoping and praying that he'll be OK at this time," Bunday told Pamplin Media Group's news partner KOIN-TV. "Anytime a member of the Hillsboro Police Department family is injured in anyway, it's a scary moment. We hope and pray for the best we also hope and pray for the best for the citizen who was affected by this incident and hope his recovery is swift as well." The Washington County Sheriff's office is investigating the crash. This story will be updated as more information is made available.